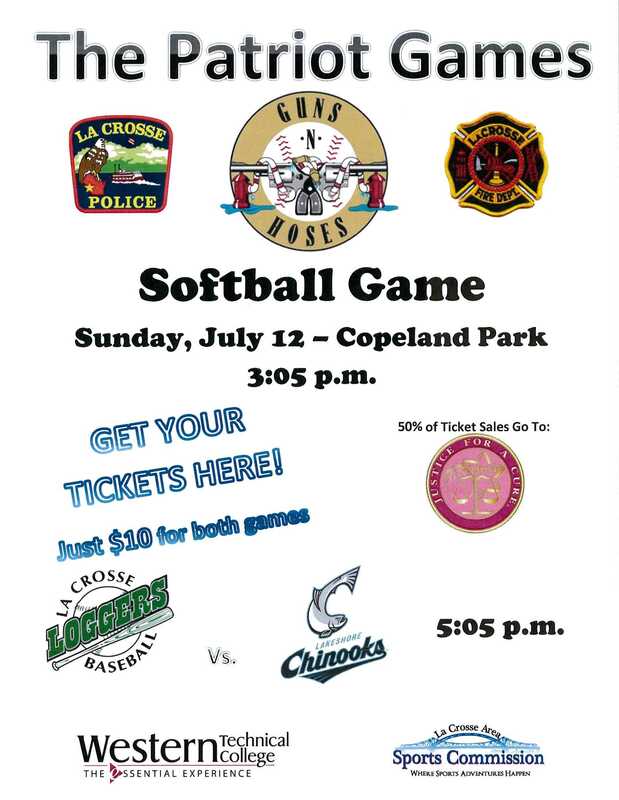 On Sunday, July 12th at 3:05PM, the La Crosse Loggers will host the 2nd Annual “Patriot Games: Guns ‘n Hoses” charity softball game at Copeland Park, pitting the La Crosse Police Department against the La Crosse Fire Department in a friendly competition. For just $10, fans will get general admission to this game, as well as the regularly scheduled La Crosse Loggers vs. Lakeshore Chinooks game at 5:05PM. Half of all ticket sales will be donated to two charities – Justice for a Cure (police) and Muscular Dystrophy Association (fire). In between games, the La Crosse Area Sports Commission will pay tribute to members of the La Crosse Police and Fire departments in a special ceremony. Police Department – 400 La Crosse St.
Fire Station #1 – 726 5th Ave. S.
Fire Station #2 – 620 Monitor St.
Fire Station #3 – 1710 Losey Blvd. Fire Station #4 – 906 Gillette St.
Loggers Ticket Office – 1225 Caledonia St.
Western Technical College, presenters of the “Patriot Games”, will also be donating an additional $300 to the charity of the winning team. We look forward to defending our title as the winners of the “Guns ‘n Hoses” charity game! For more information, click to download a PDF version of the Patriot Games Flyer or visit the La Crosse Loggers website.